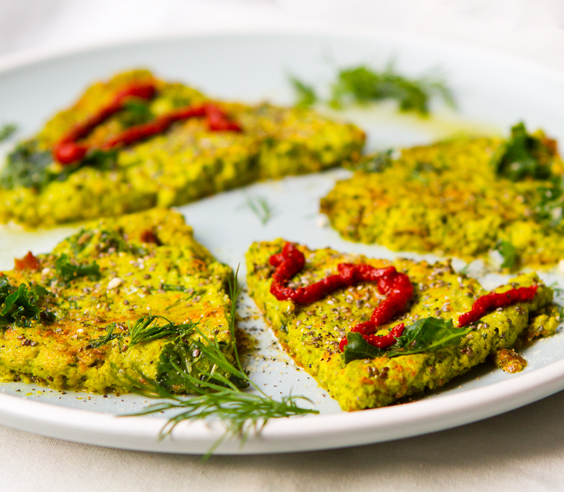 Fresh Herb Tofu Frittata with harissa, chia and kale. 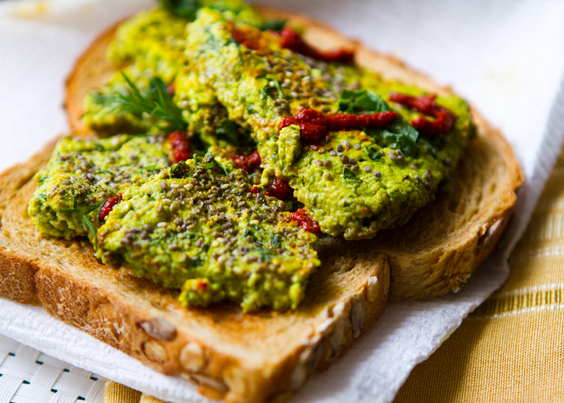 Green sprigs of fresh dill and parsley dot this warm breakfast plate. 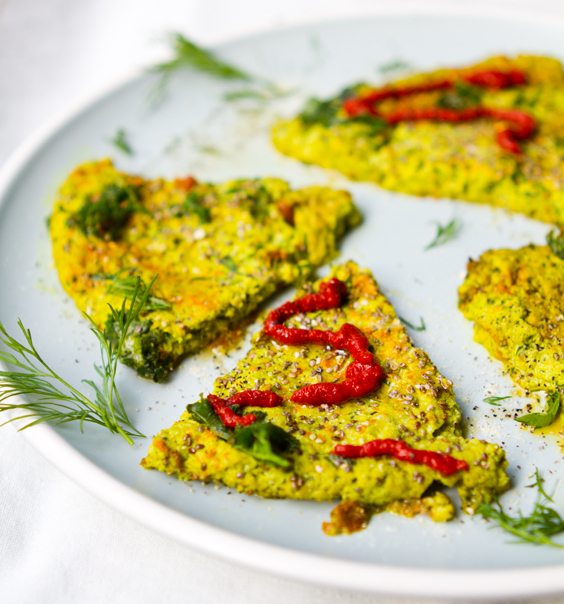 Today I'm serving up a new recipe: Fresh Herb Tofu Frittata with chia seeds, kale and spicy harissa. 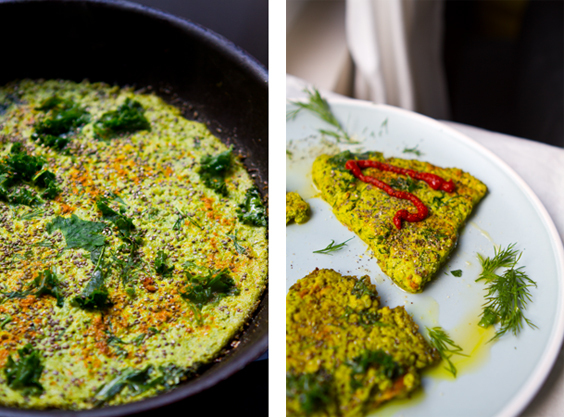 I've been dreaming of making a vegan frittata for a while now and with a fridge filled with fresh herbs (cilantro, dill and parsley) I simply had give a pan-cooked frittata a try. 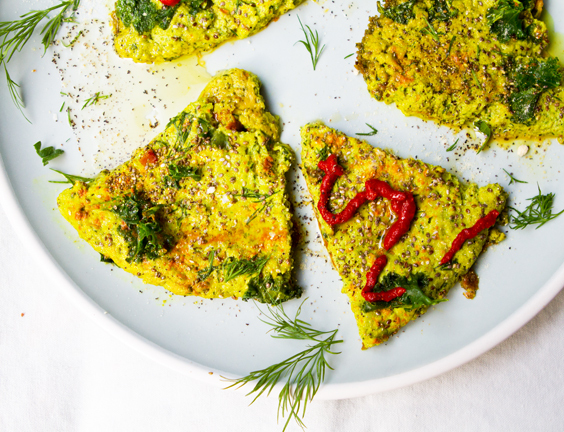 This vegan frittata takes some patience and practice, but it's a worthy vegan substitute for frittata lovers. 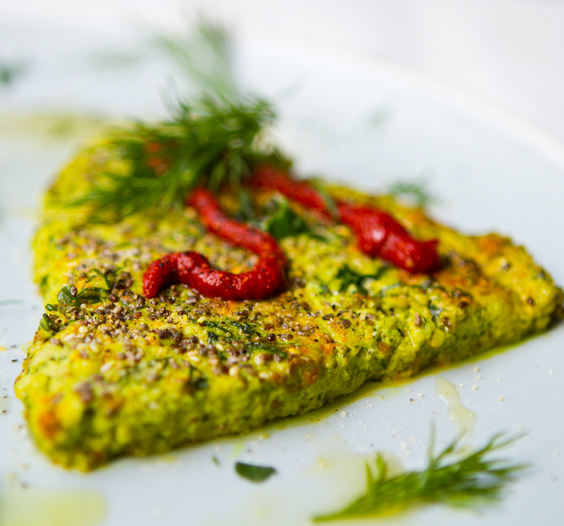 You can serve the frittata warm and soft or chilled - with a firmer quiche-like texture.. The Flavors. 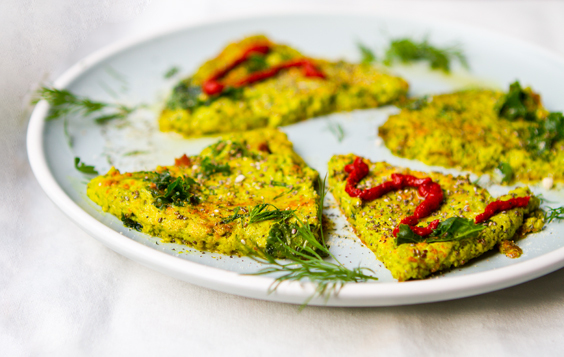 Cheesy richness and a golden color from the nutritional yeast - plus a vibrant dash of turmeric. Chopped kale, fresh herbs and a splash of truffle oil just for the heck of it. Tamari adds the saltiness - no table salt needed. 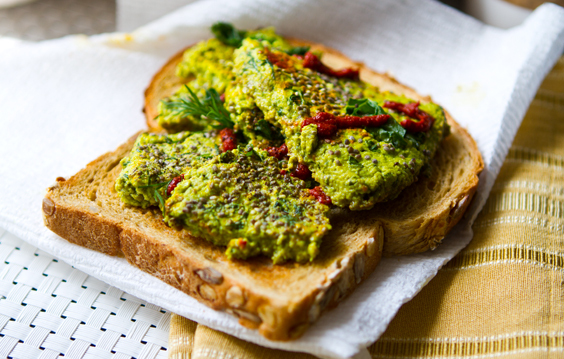 Chia seeds to help bind everything together without getting fancy with egg replacers, starches or special flours. 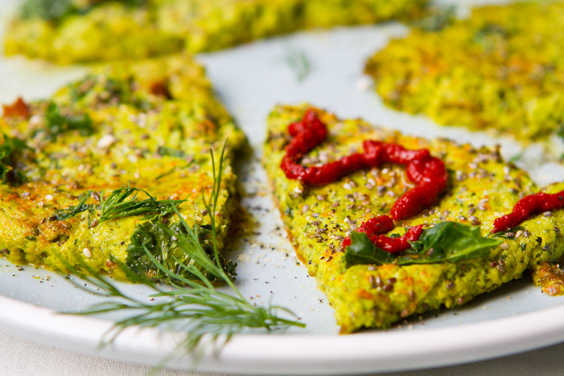 Each steamy frittata slice is topped off with a swirl of smoky, spicy harissa. The fragrance of this dish is intoxicating. Bold yet delicate herb aromas make me think of spring, and a grassy morning breeze. Brunch in the park. Birds. Sunshine. Join me in this "I'm-ready-for spring" breakfast feast. Build a Better Egg (Frittata). My first shot at vegan frittata-ness went well. But I'm always looking to make it better. Maybe a sprinkle of vital wheat gluten or perhaps some flour would assist binding this recipe together a tad more. Right now I'll call this a pan-quiche meets tofu frittata. 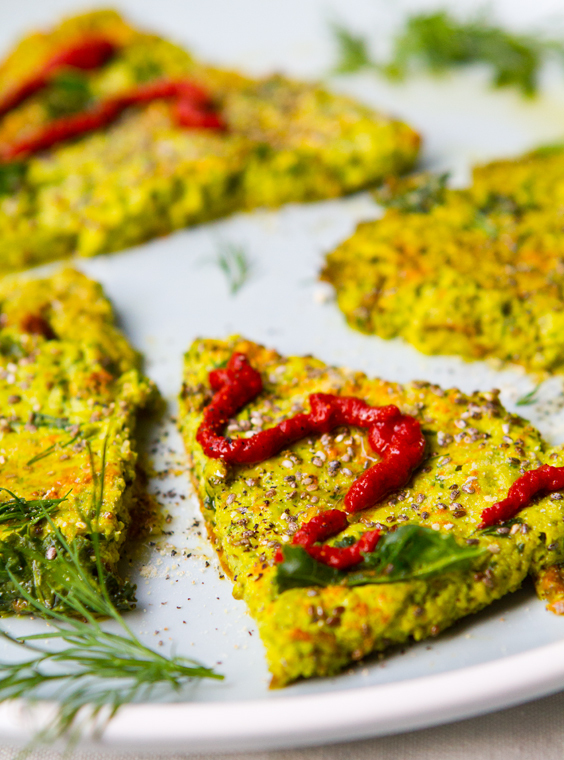 Have you ever made a vegan frittata or omelet? What is your secret? Perfect Pairings.. Stack a tower of warm toast on the table. 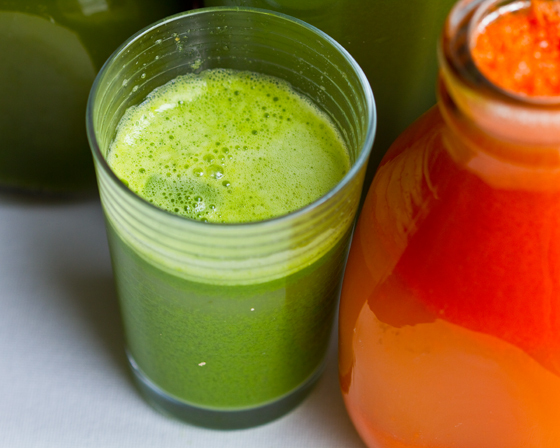 Squeeze some pulpy fresh orange juice or press some frothy green juice. 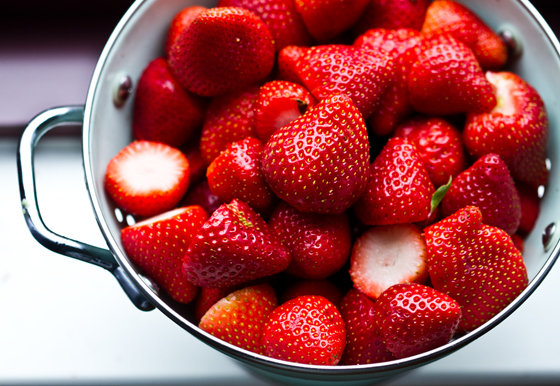 Toss a fresh fruit salad or slice a few elbows of melon. 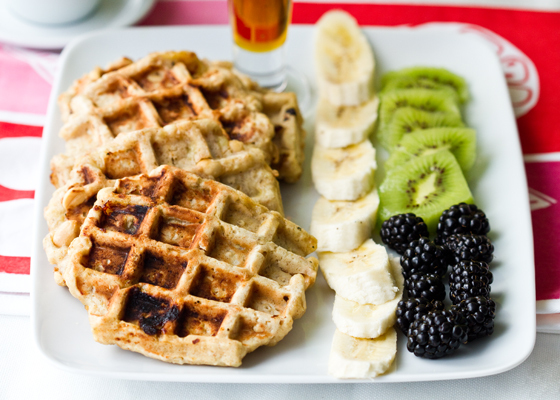 Brew some tea or coffee and melt into your morning with this handcrafted vegan breakfast. Rustic and glorious. 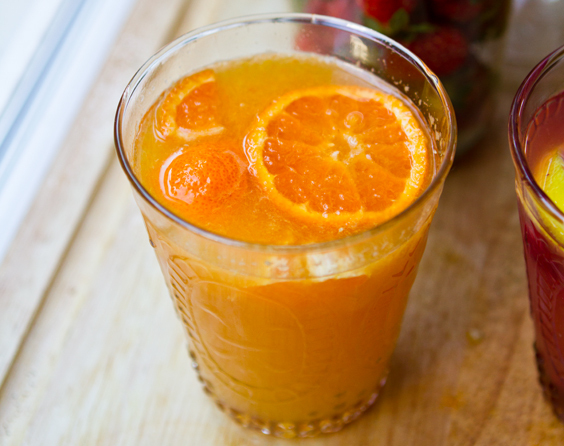 Try with a Citrus Agua Fresca..
For a full on feast - serve with some maple banana peanut butter vegan waffles and fruit..
Or some simple fresh strawberries - always welcome at a breakfast table!.. Change it up. Toss in whatever your have ingredients may be. Mushrooms, onion, shredded carrot. Just be sure to dice the ingredients into small bits so that they don't interfere with the binding too much. Update! Just tasted the frittata chilled and it was awesome! Kind of like a vegan quiche. The texture firms up nicely. Serve this dish warm or chilled! So much flavor. 1. Add tofu and all other "blend" ingredients to blender - I used a Vitamix. Blend on medium until smooth. 2. Heat 2-3 tsp vegan butter in a small saute pan. Wait until it starts to sizzle and get hot. 3. Pour tofu mixture over top vegan butter - slowly. It should sizzle a bit. Pour until the mixture covers the pan and is about 1/2 inch deep. Top poured mixture with the topping ingredients (a few more pinches fresh herbs and kale, chia seeds and optional minced shallot or onion). 4. Cook on med-high heat for about 3 minutes. Then cover pan with lid and reduce heat to medium. Allow to cook covered for about 7 minutes. 5. Remove lid and cook for one more minute just to dry out a bit - release moisture. Turn off heat and let frittata stand for five minutes in pan. 6. Even after letting the frittata settle it will be very delicate. You will need to slice with much delicacy and use a wide spatula to transfer to cool plate. As the frittata cools it will bind up significantly. 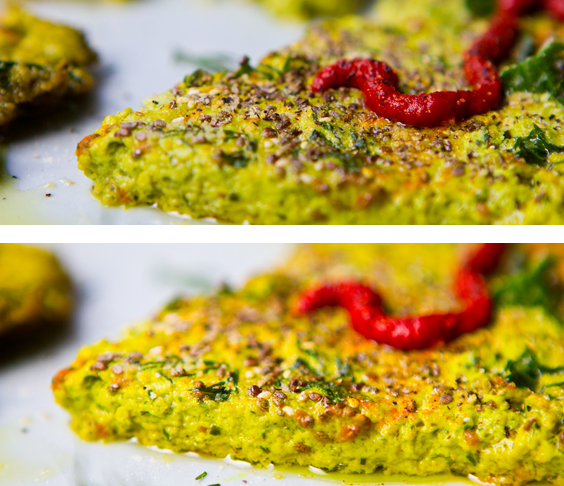 So you do have to option of serving the frittata chilled if you want a firmed up texture. 7. 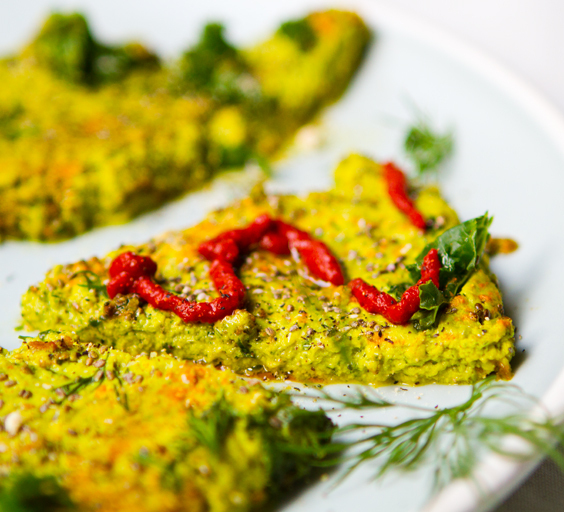 Sprinkle garnish over top and a swirl of harissa paste was the perfect spicy touch for me!